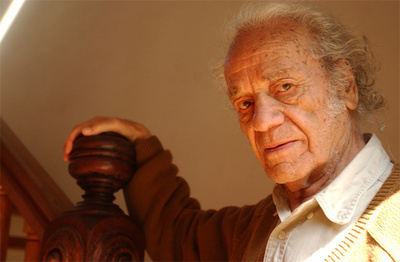 The well-known Chilean poet, physicist and mathematician Nicanor Parra turned one hundred years old this week, and has therefore been celebrated throughout the country and beyond. Amid the surprise of his centennial life, however, the question of why he has never won the Nobel Prize in Literature arises again, and his own grandson, Christopher "Tololo" Ugarte, commented about it a couple of days before his grandfather’s birthday. Parra has been proposed several times to the Swedish Academy since 1995, following his literary contributions in the national and Latin American literary canon. Among his contributions is the “anti-poetry”, which was developed in the fifties redefining slang, and the concepts of high and low culture, thus reorganizing the literary tradition. He also incorporated visual elements beginning with "Quebrantahuesos" and then with "Artefactos". He even contributed to the Spanish language translation with Shakespeare's King Lear. At the same time he has received a number of prestigious awards, including the Queen Sofia Poetry Prize in 2011 and the Cervantes Prize in 2011. Despite the career he has established over the years, Parra has never been chosen by the Swedish Academy to be awarded the Nobel Prize in Literature because of two reasons, according to his grandson: one would be related to political issues and the other one to love affairs. Parra has struggled with the left-wing governments, such as Fidel Castro’s Cuba and Salvador Allende in the days of the UP (Popular Unit), especially the episode in which the Chilean poet was photographed posing next to Pat Nixon, wife of the then President of the United States. In fact, he was a guest at the White House when suddenly Mrs. Nixon appeared to give him a book, but the photo looked like he was giving the book to her. Moreover, Ugarte, the poet’s grandson, explained that his grandfather held a relationship with one of the former members of the Swedish Academy, and following the failed relationship, she publicly said that Nicanor Parra would never get the Nobel in her lifetime. She died two years ago. Ugarte said that he know understands the situation in the same fashion as his grandfather. There are so many great authors who never won the prize, like Borges, that it does not question the quality of his literary work or life achievements. Also in Latin America, the Mexican author Carlos Fuentes died two years ago at 83, after being mentioned as a candidate for the same prize.